Tactile- Finger paint the blue sky. Scissor Skills- Cut the toilet paper role in half. 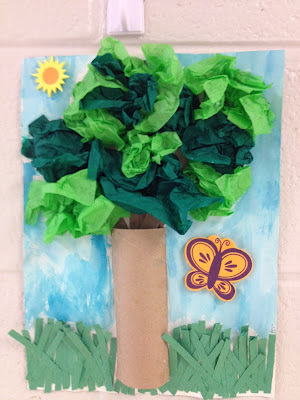 Snip the construction paper to make the grass. Fine motor- "Scrunching" the tissue paper to make the tree leaves. Gluing Skills- Glue on the t.p. roll, grass, and tissue paper leaves. Fine motor- Peel the paper off of the butterfly and sunshine stickers, then place them on the picture. Perfect! Saw this on Pinterest. Awesome! Thanks for sharing it.